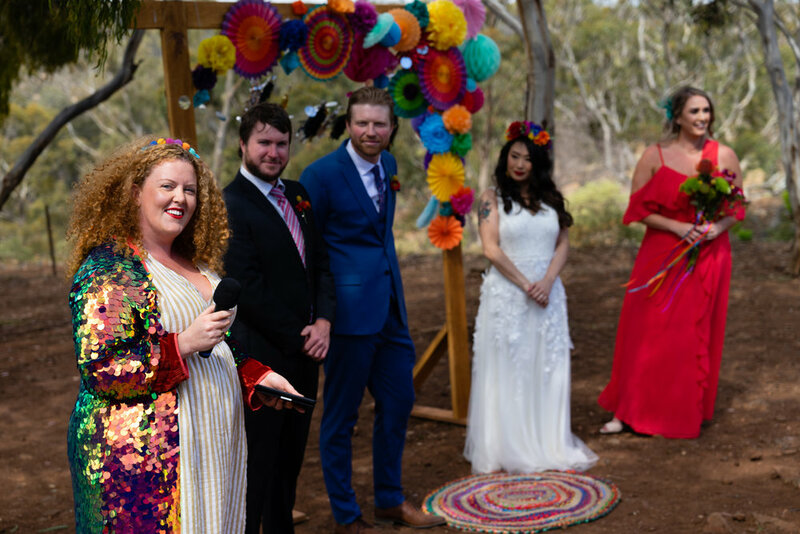 When Emily and Andrew emailed me to enquire whether I was available for their wedding and used the words “colourful”, “fiesta” and “festival vibes” - I was sold! 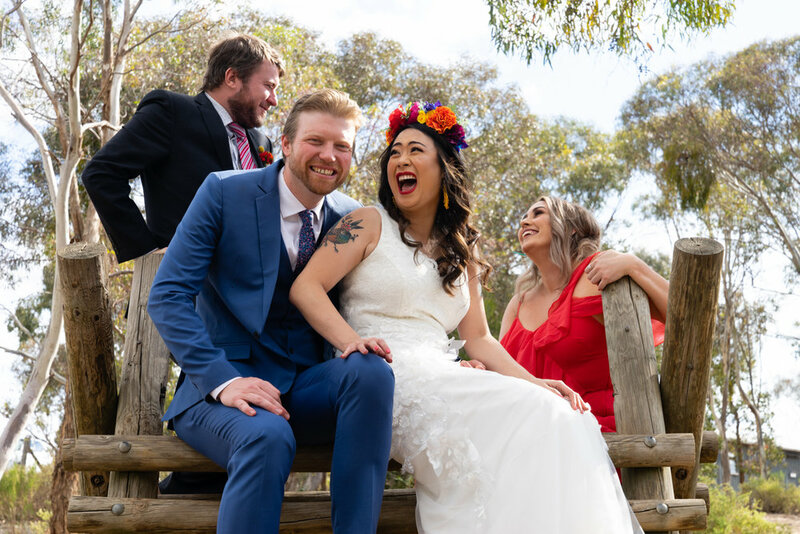 From there they put their trust in me and gave me a huge amount of creative control to create a fun, personal wedding with lots of laughter and smiles. 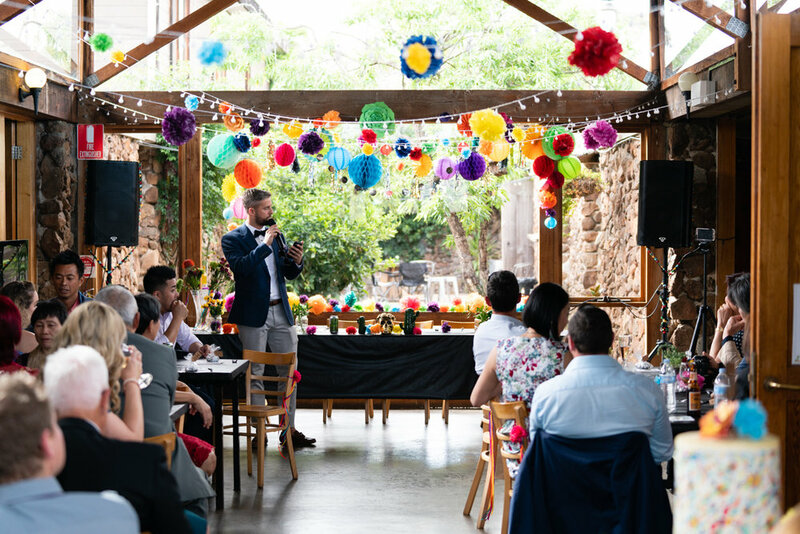 Held at one of Victoria’s best venues for a DIY and festival vibe, Camp Sunnystones was the perfect place for them to create something special for their guests and their wedding. Read all about their day here. How did you meet? We met at a wine tasting event at Federation Square, Vic 100, featuring 100 of the best wines in Victoria. The conversation flowed much like the wine! Tell me about the proposal… The proposal took place one year later after we met at exactly the same venue and same event. Andrew shrouded the proposal under the guise of a birthday celebration and surprised me by arranging a video on the big screen, in front of our friends and the wine-drinking public. He got on bended knee (after having cut himself out of a caste) and popped the question. And of course I said yes! What was the first decision you made when planning your wedding? 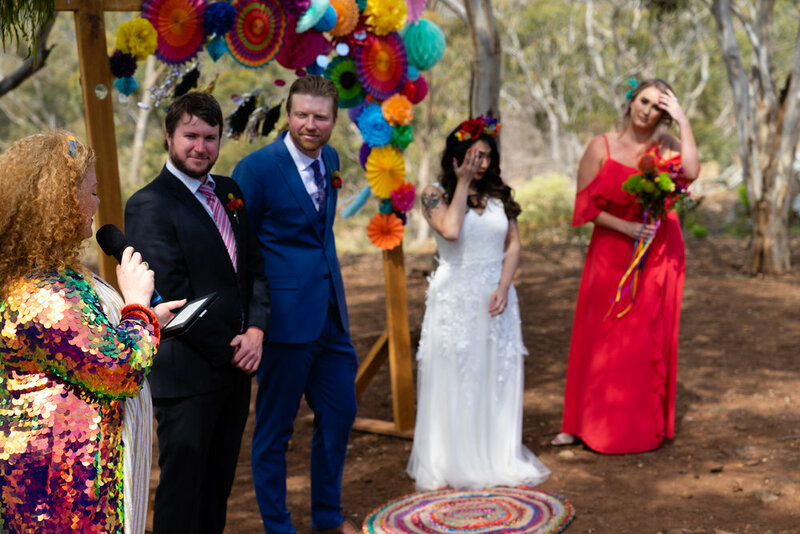 The venue was the most important to us because one, they get booked out early in advance but also two, because we wanted a festival/camp style wedding. How did you both plan the wedding? Andrew undertook the more creative and outside-the-box things like our night garden, gallery and CDs (which we gave as part of our favours). Planning was long as it was completely DIY. The venue is a blank canvas so nearly every aspect needed to be thought about. Luckily we have a friend who is an event planner who helped with synchronizing everyone on the day. We wanted to ensure it was in our budget as we are saving for a home. Otherwise, we are a fairly relaxed couple so found compromising wasn't a significant issue. The key is early planning and using all your resources to make ends meet. 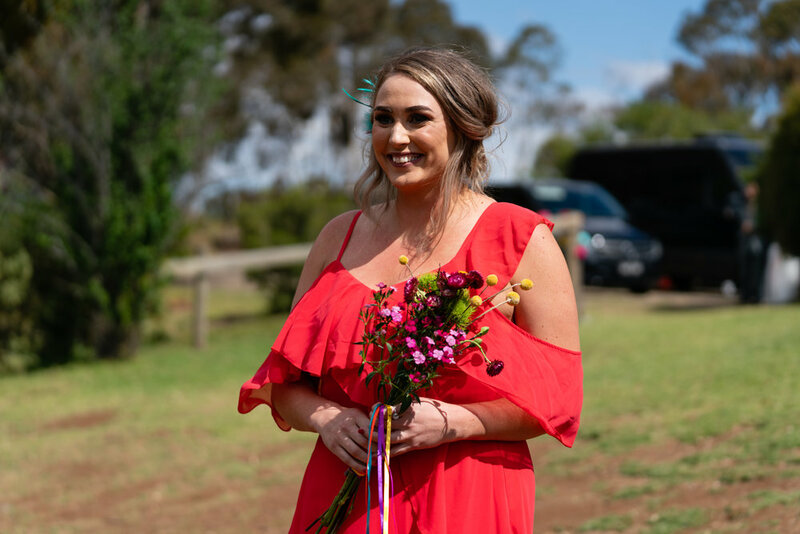 We're glad we… selected a venue which facilitated a weekend getaway in conjunction with the wedding. We're happy that we… didn't stress about perfection. 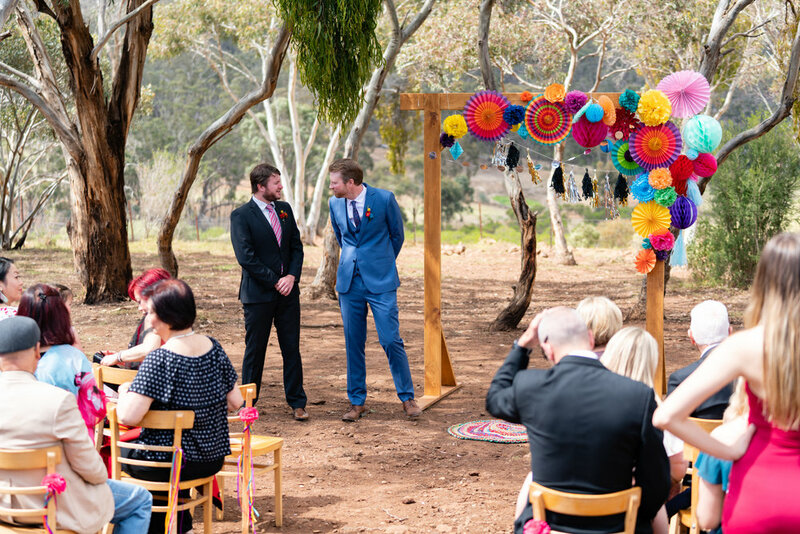 The best thing about our wedding was… everyone enjoying themselves and celebrating our marriage. Were you nervous in the lead up to your wedding? My nerves came on much earlier during the planning phase and the entirety of it was overwhelming. Andrew's nerves came on later in the piece, about a week prior to the wedding as the enormity of it sunk in. In ways it was good our nerves were on separate occasions as we could support each other at our respective times of need. What was the best piece of advice you were given in the lead up? Dont worry about the small things, if they don't go to plan, no one else would know the difference. What’s your best piece of advice for couples that are arranging their wedding? Start early, chip away daily. If you're on a budget buy second hand supplies (i.e. decor from Market place) and shop around! Don't settle because you feel overwhelmed or compelled to. As much as a wedding is for friends and family, it's also for you as a couple. Make sure it represents something you love or believe in. Who was your favourite stand out vendor? It's so hard to pick a favorite as everyone and everything came together seamlessly. Precious did a wonderful job celebrating our wedding. She understood the feel and vibe and made us feel comfortable and relaxed. Our caterer worked under enormous pressure to feed our ravenous guests and came through with wonderful praises. Anything funny and unexpected happen on the day? Yes!! We did not anticipate getting married next to a bullant nest! A few we're climbing up my dress and my maid of Honour frantically swatted them away. Do you feel any different now that you are married? We both feel proud to be married. We wouldn't call ourselves traditionalists but it's such a magical feeling to be united this way with a memory that we will never forget.